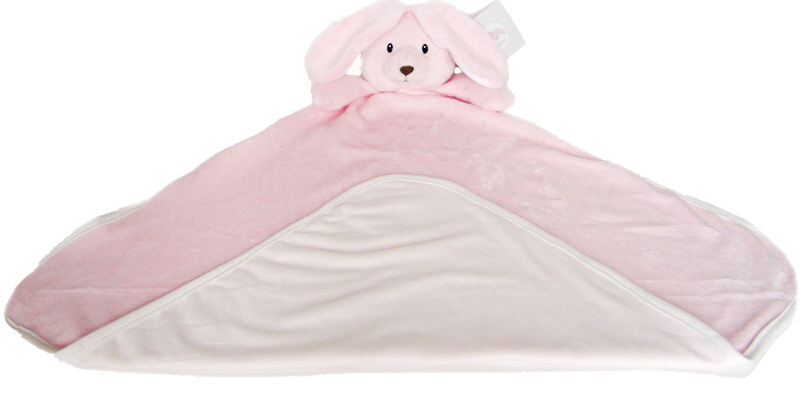 There is nothing more feminine than this adooorable little bunny security blanket in pretty baby pink! With its long ear extensions and that innocent looking face, this security blanket is sure to win the live if your baby girl! This cozy security blanket will be your child's first best friend. She is sure to love the huggable feeling of her custom embroidered Lovie. 18 inch Personalized Security Blanket with Pink Bunny Rabbit Head & Arms. 80/20 Polyester/Cotton with Jersey Backing. Your baby's new companion buddy! Personalize it with your little one's name and birthdate for a small embroidery fee! Each line is up to 12 characters .